Dentures are removable false teeth made of either acrylic (plastic) or metal. Advances in denture technology allow modern dentures to be made of flexible acrylic or with special attachments to greatly improve their fit and comfort. There is no longer a need to struggle on with uncomfortable or loose dentures when you could experience cutting-edge denture technology and greatly improve your quality of life. 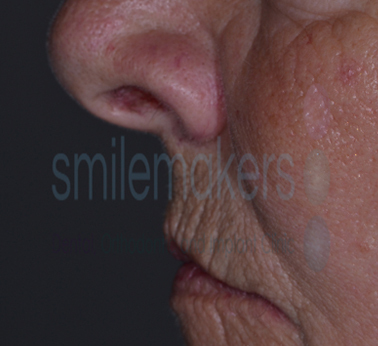 Christine attended Smilemakers looking for a solution to her unattractive and worn dentures. She was struggling to eat with the teeth and wondered whether a high-quality set of dentures could be the answer. A beautifully crafted set of teeth were constructed, enabling her to smile again, allowing her to chew properly once more and also improving her facial profile. A full denture will be fitted if all your upper or lower teeth need to be removed or you are having an old complete denture replaced. They can be either metal-based or fully-acrylic. 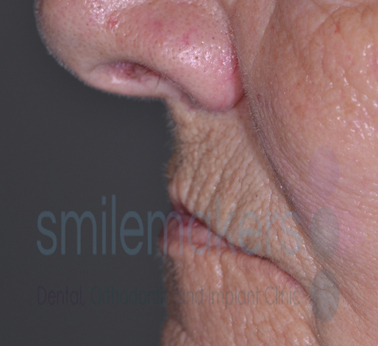 Complete dentures usually require a number of visits to make and can take some getting used to. They are very dependent on the quantity and quality of bone that you have left in your jaw, and the quantity and quality of saliva in your mouth. 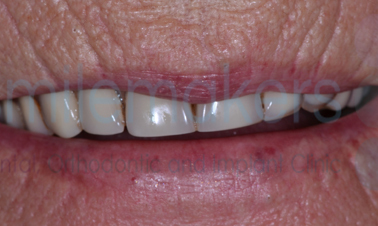 Lower dentures generally tend to be more troublesome than upper dentures due to a lack of bone in the lower jaw but this can be addressed using implants to hold the denture tight. 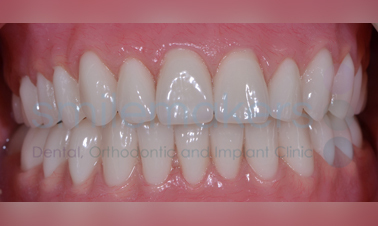 A partial denture is designed to fill in the gaps left by a few missing teeth. It is either a plastic or metal plate with a number of false teeth attached to it. 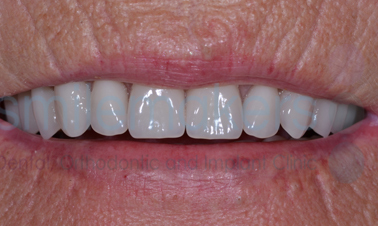 Creating special attachments for adjacent teeth to engage the denture can result in a denture that looks fantastic and does not threaten to drop out of your mouth! Please ask your Smilemakers' dentist about which option is best for you. Flexible dentures are a recent invention and differ from traditional dentures in that they are made of a flexible acrylic which can allow a better and more comfortable fit than traditional dentures for many people. With the absence of any metal frame and using super-thin, but ultra-strong materials, there is no bulky feeling and they blend in much better with your gums. And because they are so flexible, they move more naturally during talking and chewing than traditional dentures ever could. Please ask your Smilemakers dentist about flexible dentures. The general rule is: brush, soak, brush. Always clean your dentures over a bowl of water or a folded towel in case you drop them. Brush your dentures before soaking, to help remove any food debris. Using an effervescent (fizzy) denture cleaner will help remove stubborn stains and leave your denture feeling fresher. Always follow the manufacturer's instructions as some denture cleaners are not designed for metal dentures and vice versa. Then brush the dentures again, as you would your own teeth, being careful not to scrub too hard as this may cause grooves in the surface. Most dentists advise using toothpaste and a small to medium-headed toothbrush. Make sure you clean all the surfaces of the dentures, including the surface which touches your gums. This is especially important if you use any kind of denture fixative. Some people have sensitive gums and may need a softer lining made for their dentures. If you have one of these special linings, it is important to check with your dentist before using any cleaning products or fixatives as some products can damage the lining. Can I eat properly with dentures? When you first start wearing dentures you should eat soft foods cut into small pieces, and chew slowly using both sides of your mouth. Avoid chewing gum and any food that is very sticky, hard or sharp-edged. You can gradually start to eat other types of food until you are back to your old diet. Never use toothpicks. What is the best type of denture adhesive? 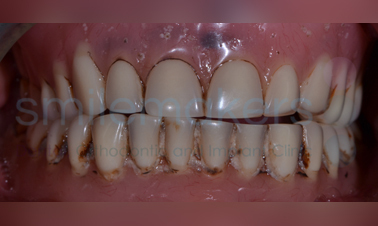 You should not usually need to use denture fixative if the dentures fit properly. However, if your jawbone has shrunk a lot, adhesive may be the only way to help retain them. Fixative should usually only be necessary for a short period of time if your dentures have become loose, just while you wait for your replacement dentures. Ask your dentist for advice. It is important to visit your dentist regularly even if you don't have any of your natural teeth. Dentists do not only check teeth, but also the soft parts of the mouth, including the tongue and cheeks. These examinations are just as important, so the dentist can spot any infections, mouth conditions or even mouth cancer at the earliest stages. Your dentist will be able to tell you how often you should visit. Dentures should last for several years if you take good care of them. However, your gums and jawbone will eventually shrink and the dentures may not fit as well as they used to and become loose, or they may become worn.